5 stars - "Continuous Ink Supply System (CISS) for Epson Artisan 1430" by Daniel, Written on 2012, 18:28/06/27 Really saving. 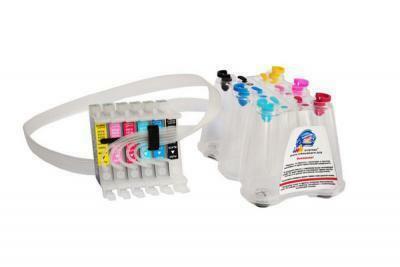 CISS Ink System for Artisan 1430 is successfully applied for economical printing. It is appropriate both for professional printing and for personal purposes. The owner of CISS Artisan 1430 acquires high quality of printing along with its low prime cost. That is the reason for growing popularity of the Ink System for Artisan 1430 among the clients. Economy in usage. This aspect influences the prime cost of printing strongly and cuts it by more than 20 times. Comfortable operation. The tank of the CIS is rather roomy, so can contain much ink. This will help you to avoid frequent refilling the cartridge. The CIS is absolutely safe for any printer, because it is produced in accordance with highest world standards in South Korea. The CIS has 100% compatibility with any type of printing device, thus has no operation limits. Thus as you see, this CIS (CIS for Epson Photo 1290 or other one) is a great alternative to all original consumable supplies. Having tried any of our CISS products (CISS Ink System Epson Photo 1270 etc. ), you will be fully satisfied by the quality and prices for the products. We are sure that our CISS can be rather helpful both at your home and powerful printing enterprise. Low ink consumption and perfect printing level are the characteristics you need. Browse through numerous products supplied by our company and select the one that suits you most of all. We are ready for cooperation.